Kreative Kristie: Essentials By Ellen Late Summer Release Hop & Giveaway!!! Essentials By Ellen Late Summer Release Hop & Giveaway!!! Hello, and welcome to the Late Summer 2016 Essentials by Ellen Release Hop! I am so excited to be joining in this amazing hop showcasing several of the new stamp sets and dies! You should have arrived here from the amazing Julie Ebersol's blog. If you get lost along the hop, please visit the CLASSroom blog for a complete list of all the designers. My first card showcases the awesome Silver Linings Dies, Sunshine Words & Warm Fuzzies stamp set. I started by die cutting both of the sun ray dies from white card stock. I then sponged Spiced Marmalade & Mustard Seed distress inks onto each die cut creating a sun effect with the Spiced Marmalade in the center and then Mustard Seed towards the edges. I flicked some water to add some cool water effects. I then attached them together onto a scrap piece of card stock and spritzed the whole thing with Sheer Shimmer Spritz. Here is a close-up to show you the sparkle. I die cut the sunshine die using black card stock. To get the shine, I covered it with Versamark ink and then clear embossing powder. So cool. The sentiment is from the Warm Fuzzies stamp set, I just masked off "sunshine". My second card features the adorable Sock Monkey Surprise stamp set with matching dies. I started this card by creating a panel using Ultramarine Blue & Violet Color Bursts. I then stamped and die cut the monkey and balloon and heat embossed the sentiment in white on black card stock. I used an extra bit of the color burst panel to paper piece his belly to match the background. Such a fun set. YAY!!! I also get to give away an Essentials by Ellen stamp set! The winner may chose ANY Essentials by Ellen brand stamp set (Maximum value $25 USD) currently in stock at Ellen Hutson.com To enter my giveaway, please leave a comment on today’s post by Tuesday, August 23rd! Your next stop on the hop is the amazing Sharon Harnist. If you get lost along the hop, please visit the CLASSroom blog for a complete list of all the designers. Love that Silver Linings die. It is a must have for me. I normally hand cut all the triangles for my sunburst cards. This die is perfect and doesn't have those lines in between each ray like most other sunburst dies. This will be great for my pattern paper sunbursts. Great cards! Love this release! Love the bright colors. Your cards are so fun & cheerful. Such amazing use of COLOR on both of these, Kristie!! I really LOVE this release. Thanks for such great examples using them. Love these fun cards. Love these cards! That monkey is too cute! Color makes all of your cards so special. I liked how you used the silver lining die. cute cards especially watercoloring sock monkey! I love both of your cards!!! Adorable! What wonderful cards! Love the simple designs! Thanks for the inspiration! I love the water effect on the sun card. It's almost like sun spots. The monkey card is fun. Love them both. Wooohooo Kristie! These are fabulous! Loving the sunshine die and you're color bursts look totally amazing. Wow! lov love LOVE the colors. So great. love the release too. Love the backgrounds! And your sunshine card is absolutely WOW!! I really love your creative style! Your cards are always so classy and beautiful! Thank you for sharing your incredible creations, Kristie! Your sock monkey card just makes me smile. Thanks so much for your great ideas for these stamps. Kristie your cards are always so clean and bright, and these two are no exception. The sunburst is gorgeous and your little sock monkey looks happy and adorable against the blue background. I like your clean style! Beautiful card - I love sunshine cards and I really need that set of dies. I can almost feel the sunshine. 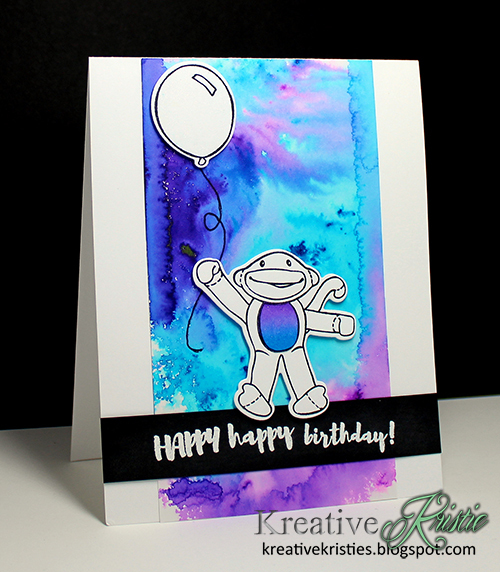 Love the sock monkey card, soft watercolor effect, like the balloon too. Great for a birthday. Love your cards Kristie! I especially like the watercoloring on the sock monkey card! Just love the vibrant sunshine card! The sock monkey is the cutest little stamp! As always I love your cards! This is a very versatile release and I can already imagine many ways to use these new stamps and dies. Thanks for the chance to win. Love the beautiful bright colors you used! Beautiful cards, love the vibrant colors! I love the color combo and the super-shiny "SUNSHINE"! Such beautiful cards! Love the colors! Loved the sunshine card. The colors are so bright and cheerful. I just love the brightness and fun nature of your cards! Wonderful cards - especially love your bright and sunny card. This is really an awesome relase. Love your colouring tech. So bright and well done. That sunshine card is absolutely wonderful. I really like this late summer release and your cards are so creative! Wonderful sunburst card. I love your ink work. Thanks for sharing with us. Wow! Great colors. Best idea to leave the monkey plain...such a cute card! I love the bright colors of your cards. Great job. Clearly, you know what to do with color. Both cards are extreme eye-candy. I love your cards, and I just ordered some Colorburst, can't wait to try it! Totally in love with these cards. That warm sunshine card makes me smile and the purple and aqua was perfect for that cute lil monkey!!! Thank you for sharing! I am LOVING this new Essentials by Ellen release! Such fun products from Julie! And your projects are so lighthearted and cheerful! I love the Silver Linings dies and love what you did with one of them here. Oh Kristie, these are just precious! Lovely cards! Love the pretty, bold colors you used. Very cute cards. Love this release. super fun set of cards! The monkey card is cute and I love the sunshine card. It makes me happy and smile. Great cards! There is so much to love in this release. Wow, love your bright, happy cards! Such an adorable monkey and a must-have Silver Linings die, love both! That card with Silver Linings is so creative and beautiful and of course who can resist a sock monkey! Both cards are stunning! Love the combo of white, yello and black in the first. The background in the second is just stunning. I really love the sentiment font too! What awesome cards!! I love the bright, vibrant colors on both cards! Your coloring is wonderful. Fabulous cards! Love the Silver Linings dies, and the sock monkey is adorable! Great colors on both of your awesome cards! Great cards. Love how you did the cute monkey. Thanks. Such cheerful backgrounds, Kristie!! Fun cards! Great cards! I love the way you have showcased them in your precious cards. beautiful cards! !Sock monkey is just so cute!! So great! Love the sunshine! I can feel the heat coming off the first card with such strong warm colors! And then the cool down with the second card... like that you chose to use little color on the sock money, as it helps him jump right off the card. Thank you for sharing your great creations and for the opportunity to win a stamp set from this fun release! Cute cards!! Love the Sunshine accessory one! such adorable cards!! So bright & cheerful!! Love love love your sunshine card! Such a great way to combine these new fab products! Love both of your cards; the perfect combo of B&W with bold colors and designs! TFS. Oh, these are so fun! What a wonderful release! Love the Sunshine card's beautiful coloring! Pretty cards! Kristie, love your cards. Thank you for sharing. Beautiful sunset card! Both cards are well done. 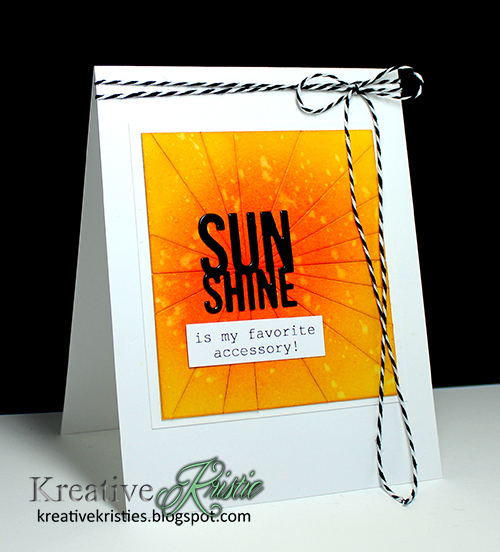 Love the bold contrast of the Sunshine card!!! Love the sunshine card and the bright colors on the sock monkey card. Thanks for sharing. So pretty what you have done with the dies and stamps. The Brusho background was unexpected and beautiful. Great use of vibrant colours! Very cheerful cards Kristie! The colour burst looks so fun to use. Kristie congratulations on guesting for the release hop and both of your cards are amazing! Love that sunshine die and the watercoloured background on the sock monkey!! Love it all! Great cards! Gorgeous sunshine card, so cheerful. WOW! Love your brilliant backgrounds! Thank you for sharing your beautiful cards as well as the chance to win! Wow - love these cards, they are striking! Such beautiful and vibrant colors. wonderful cards, Kristie - especially love your "sunshine" card! Love the Silver Linings set! Everyone needs a little sunshine sent to them. Your card is lovely. Your cards are great and so is this new release!!! Such fun cards Kristie. I love the pops of color! Great designs - and a fabulous new release. I love it all. Your cards were great! Thank you for the easy to follow descriptions... They were so easy to follow. Tim loving this release and you're cards! Great job on the cards, Kristie! Thanks so much for sharing with us and for participating in this great hop and giveaway. Love this release! So much variety and so many choices! Cute, cute cards and a great release from Ellen & company! :) It includes everything from super cute to very elegant! Cute cards. So mNy great products in this one! I love the Sunshine die. That and the silver lining. Fantastic card on that one. Sock monkey card has cute colors. Love your take on this great release. Who can't use some sunshine. Sock monkey has always been a friend of mine. Thanks for inspiring. I just love that sock monkey card. I love the sun in the first card and the brilliant background in the second card. Gorgeous cards, Kristie!! Love the way you spotlighted the sentiment diecut on your first card - so cool!!! Dare I say it...brilliant use of these new products. And the amazing cards...oooh...be still my heart. Oh, the colors are so pretty! Great cards! Love your creations. So excited about this new release! Oh wow, your Sunshine card is great. Love the colors. All of this wonderful inspiration is and yours is a delight! Love the silver linings cards especially! Fabulous release and fabulous cards! Love them both. Love the pretty sunshine card. It makes me happy. But so does the sock monkey. I love the purple and blue watercolor and the matching belly...lol! Beautiful cards, love your backgrounds ! great cards Kristie, I love your bold and brilliant colors on both! They are so striking! Awesome being on the hop DT with you! Wonderful bold and graphic cards! That first one is just CAS perfection! Beautiful Sunshine card! I love that die, so versatile! 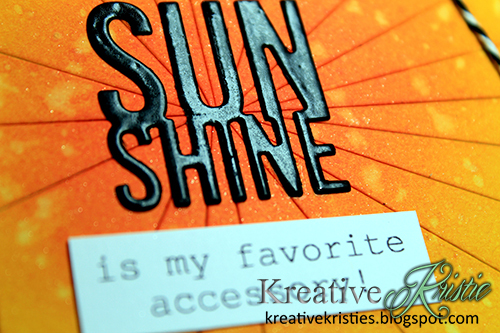 Love how you used The Silver Linings dies- I really want that one, a lot. Love your water coloring. Thanks for the share. Really great creations, thank you for sharing your talent with us! Love your cards especially your sunshine card it is so stunning! Oh Kristie these are fabulous - love the sunshine one, your colours are amazing, and the sock monkey - who couldn't love him!! Love his paper pieced tummy! Your bold backgrounds are perfect! Lovin' that bold sun, and the fact that you used BOTH dies! Sock monkey colors are very magnetic! I love the backgrounds on both of your cards. I'm definitely going to get the silver linings die. I love it and what you've done with it. Such wonderful ideas! Love the sunshine card, in particular! I loved the nontraditional colors you used on the sock monkey! But I especially loved the sunshine card. I loved the bright yellow colors and the heat emanating from the card! The black lettering really stands out. Thank you for sharing your talent with us! So pretty!! Love the watercoloring on both the cards! Thanks for the splendid ideas!! Beautiful, bright, colorful cards. Kristie!! I really love your use of color and that you're not afraid to USE it! ♥ Fabulous! Wonderful cards. I'm a real sucker for watercolored backgrounds, well anything watercolored. These are great, thanks for sharing your talent with us. Really pretty, love the bright colors. Great cards and the watercoloring techniques are wonderful. Love your sunshine card - so bright and cheerful. love those dies!! Way to put the shine in "sunshine"! I'll have to remember this. And your monkey- so cute...great way to tie the background to the monkey with the bit of belly color :-)! Neat cards! Very cute monkey. Wow, stunning cards!! Especially the first one is so eyecatching beautiful to me, love it! Gorgeous background for mr. Sock monkey! So cute! Blue and purple background is beautiful! WOW! The background is amazing! So fun + fab! LOVE your use of color!!!! Beautiful cards! Love the background, especially the sun shine card. Great cards. I'm putting that Silver Linings die on my "must have" list. Love the colors on your sock monkey card. Great ideas! Love the sunshine card!! Thanks for sharing on the blog hop. Love both cards! The colorburst background is awesome! Love the cards!! This is the only release so far that I absolutely love every single item in it. Catherine Pooler's Store Opening Blog Hop! !